Platteville senior Carter Chitwood (left) poses with stepfather Shaun Reuter and stepbrother Mason Reuter, who coach and play for Cuba City, after Friday night’s game. POSTED August 24, 2018 3:54 p.m.
CUBA CITY — Rarely does a high school athletic event cause family members to choose sides in such a way. But that was exactly the case for the Reuter/Chitwood household last Friday night when Cuba City hosted Platteville in the 2018 football season opener for both schools. 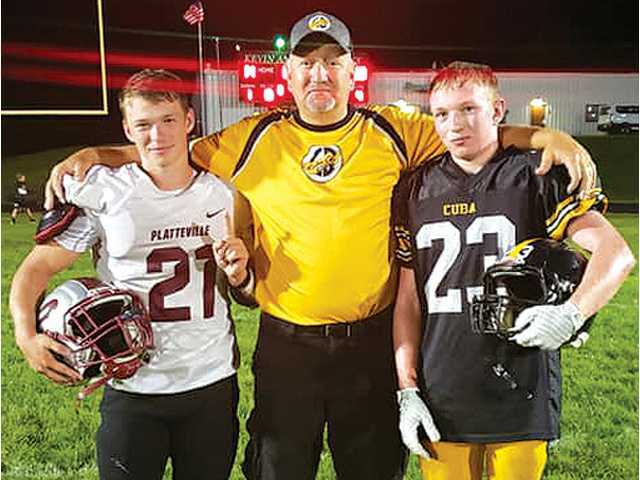 Platteville senior running back/linebacker Carter Chitwood earned family bragging rights that will last a lifetime when he and his Hillmen teammates got the best of his stepbrother Cuba City senior Mason Reuter and stepfather’ Shaun Reuter’s Cubans in a non-conference clash at CCHS, 28–14. linebacker for Cuba City. Shaun Reuter, who is a physical education and algebra teacher at Highland High School, is in his fourth and final year as volunteer defensive assistant for the Cubans. Mason Reuter — who was a first-team All-SWAL running back and a second-team all-league linebacker a year ago as a junior — scored the game’s first touchdown Friday night, but it was Chitwood that got the last laugh, and the victory, to run his all-time record against stepbrother and stepdad to 3–0. Chitwood’s Hillmen beat the Reuter’s Cubans 34–7 in the 2017 season opener, but Chitwood and Reuter played a much larger roles Friday night in the first game of their senior seasons. Platteville also defeated the defeated the Cubans 21–13 to begin the 2016 season, but neither Reuter (missed the game with a broken foot) nor Chitwood (wasn’t on varsity as a sophomore) played in that game. “I think it was really cool” said Shaun of Friday night’s game. “I think back to playing softball when I was younger and I always wanted to beat my brother or my best friends way more than anyone else and I think that was the same for Mason and Carter. Chitwood started at inside linebacker and spent time at nose tackle in Friday’s win, finishing with two tackles and a fumble recover early in the third quarter that set up Platteville’s third score. He also rushed for 24 yards on five carries as Platteville’s number two halfback. Reuter rushed for 26 yards and a TD on five carries and finished with six tackles, including a sack. Retuer started dating Chitwood’s mother, RaNah, when Carter was just three years old and has been part of his life every since. RaNah Reuter, who is the principal at Westview Elementary, was certainly rooting for Platteville Friday night, but the choice wasn’t as easy for the Reuter’s 7-year old son, Jake. Prior to the opening kickoff the elder Reuter gave Chitwood some good natured ribbing. “He was lined up near our sideline on the opening kickoff and I hollered at him, ‘we’re coming right at you Chitwood.’ He just smiled at me and winked.” said Reuter. After the game Reuter stopped in the line and gave Chitwood a hug, congratulating him on the win. Then the family stuck to tradition and took a family photo with Reuter in the middle for the third and final time.